A rain garden is an easy, low cost way to infiltrate your stormwater and bring some more beauty into your landscape. Learn the basics below, and download some helpful resources at the bottom of this page. You can also find rain garden designs in our Sample Designs page, and some helpful tips in the Lessons Learned page. We also offer free workshops on how to build a rain garden every spring and fall! Find a spot in your yard where you can easily direct the runoff from your downspout or other impervious surface. 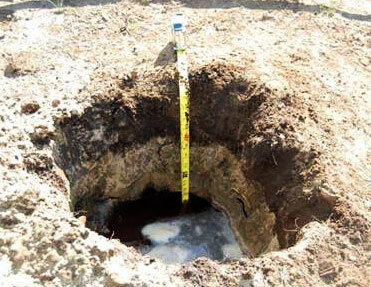 Do a “perc test” to ensure that the soils in that spot can soak up rain water. To avoid drainage problems, place your rain garden at least six feet from your house if you have a basement (two feet if you don’t) and five feet from your property line. Call your local jurisdiction to find out if you need a permit to disconnect your downspout or if there are special requirements. Fill it with water a second time. If the water drains at least half an inch in an hour the second time you fill it, your soil has adequate drainage for a rain garden. Dig a shallow depression to create a rain garden area about six inches deep. You can make it as long and wide as you like – the bigger it is, the more rain water it can soak up. 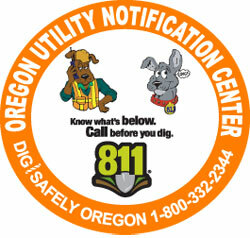 Don’t forget to call before you dig so you don’t hit any buried utility lines! In Oregon call 1-800-332-2344, or 811. Use the soil you dig up to create a berm (and pack the soil well!) on the down slope side and direct the overflow safely away from nearby buildings. Make the bottom of your rain garden level. If you like, you can amend the soil in your rain garden with compost. 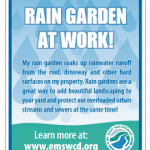 Help us track of the number of rain gardens out there and receive a free rain garden sign by registering your rain garden! Stay tuned for more designs in the sample designs page.